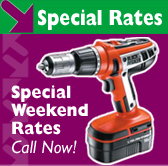 Here at Hutton Hire we understand than many of our customers need to work throughout the weekend so we have introduced Special Weekend Rates that often work out the same as our day rates. 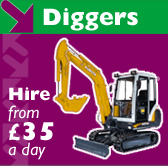 The hire allows you to use the equipment for the whole weekend from Friday pm until Monday morning offering a great saving. Check out our hire listing for the applicable rates of any item you need to hire. If you need any advice don't forget to give us a call - we're here to help!